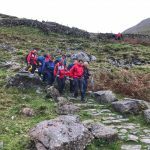 Incident Details: Another day, another callout…..This time, the Team were called to a walking group from a local outdoor centre, where an 11 year old pupil had slipped and suffered an ankle injury. We were as short on numbers today as we had been yesterday, so the Team went with 5 in the first vehicle, followed up by three more in the Sprinter; and Penrith MRT were able to turn out 6 more to ensure we had enough. It was over an hour from callout time to being on scene, but the casualty was swiftly assessed, splinted and packaged, and then sledged down to the Centre’s minibus at the foot of Mousthwaite Comb. There she was transferred to their vehicle and taken off to seek medical attention. Our thanks to Penrith MRT for their swift response. 10 Team members + 6 Penrith MRT – 3 hour 11 minutes.